Chaplet of Saint Teresa of Calcutta. 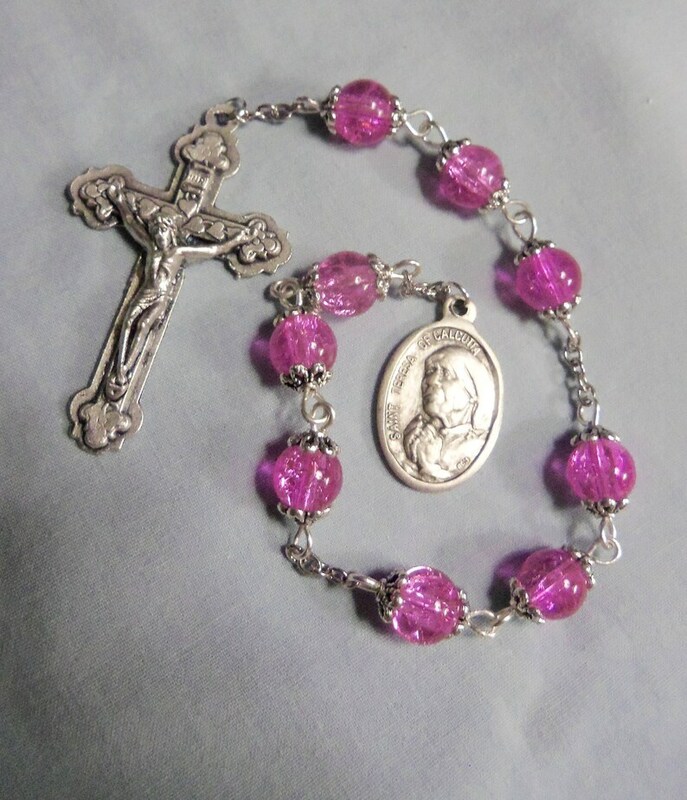 I made this chaplet using 8mm pink crackle beads nestled between tibetan silver bead caps. 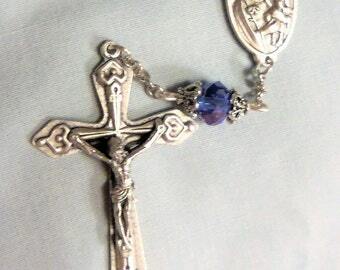 I used nickle silver chain, silver copper wire and added a Saint Teresa of Calcutta medal and a textured crucifix. It is 10 3/4" long. After several years of deteriorating health, in which she suffered from heart, lung and kidney problems, Mother Teresa died on September 5, 1997, at the age of 87. In 2002, the Vatican recognized a miracle involving an Indian woman named Monica Besra, who said she was cured of an abdominal tumor through Mother Teresa's intercession on the one year anniversary of her death in 1998. She was beatified as "Blessed Teresa of Calcutta" on October 19, 2003 in a ceremony led by Pope John Paul II. Mother Teresa was canonized as a saint on September 4, 2016, a day before the 19th anniversary of her death. Pope Francis led the canonization Mass, which was held in St. Peter's Square in Vatican City. Tens of thousands of Catholics and pilgrims from around the world attended the canonization to celebrate the woman who had been called “the saint of the gutters” during her lifetime because of her charitable work with the poor. Blessed Teresa of Calcutta, you allowed the thirsting love of Jesus on the Cross to become a living flame within you, and so became the light of His love to all. Obtain from the Heart of Jesus (here make your request). Teach me to allow Jesus to penetrate and possess my whole being so completely that my life, too, may radiate His light and love to others. Amen. Blessed Teresa of Calcutta, pray for me. Then pray 3 Our Fathers, 3 Hail Marys, and 3 Glory be's on each set of 3 beads.